That's where Stouffer's comes in. I can always grab a few boxes of the family sized meals, and in about an hour (while I sit with the kids and play a game or relax) dinner is served. I love that the kids love almost all of the meals, their favorite being the Lasagna and the Macaroni and Cheese. I have so many memories of the Macaroni and Cheese. My mom used to be a manager of a 7-11 when I was about 8-10 years old and since I didn't have a dad, most days she worked from 3-11 so after school I would head over to her job and wait with her until she was off. Every night for dinner we ate Stouffer's Macaroni and Cheese. You know, it hasn't changed since then? Not even a bit. It tastes exactly like it did 30 years ago, and I still love it, and I love that my kids like it as much as I did and still do. 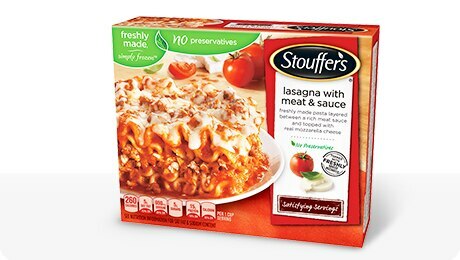 So moms, do yourself a favor this fall, pickup a few family sized Stouffer's meals and put them in the freezer, for those nights when you don't have time to make a great meal, Stouffer's will do it for you.